The Lincoln School in Livingston, Montana was built in 1914 and stayed open to students until 1974. The school has historically been used by the community for various purposes. For instance, in 1918, the school was used as a temporary hospital during the Spanish influenza epidemic. The Lincoln School is now used as a nonprofit small-business community center. The building is fully occupied by a mix of nonprofits, artists, and recreationalists; the Blizkrieg Wrestling Club also moved into the school’s gymnasium. The Lincoln School continues to be a source of community activity and pride among Livingston residents. 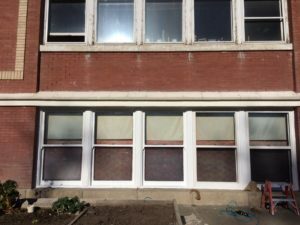 As the school aged, broken windows were replaced with unsightly glass block, and older windows deteriorated beyond the point of return. The Lincoln School Foundation used MHF funds to replace the windows with historically accurate Pella windows.